The poor college students guide to raising a baby: Did someone say Summer? Oh my, look at her go! 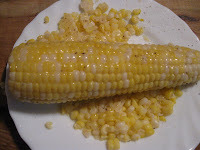 I love summer corn. Yummy! 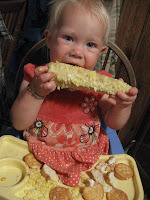 My kids LOVE corn on the cob too. They'll sit there for a good 15 minutes eating it. Can I just say Amen!!! Your daughter is so cute. That corn is almost as big as she is.